Retrieve conserved domain records that contain a term(s) of interest (e.g., chloride channel). Enter the terms in the query box at the top of this page or use the Entrez Conserved Domains Database (CDD) home page. See the help document for search tips, including a list of available search fields and examples of their use. 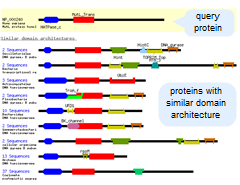 Input up to 40,000 protein query sequences as a list of sequence identifiers and/or raw sequence data into the Batch CD-Search tool, which allows the computation and download of conserved domain annotation for large sets of protein queries. Then download output in a variety of formats (including tab-delimited text files) or view the search results graphically. See the help document for additional details, including information on using Batch CD-Search for scripted data downloads.